Safari - the essence of Africa conjured up in a single word. What other word can create a mental picture full of the sights and sounds that are pure Africa. To visit this continent and not take a safari is like eating fish and chips without the salt and vinegar, only half the enjoyment. Growing up on a farm in the Isle of Man gave me a love of nature from childhood and along with an artistic ability, this eventually led me to a new career as a wildlife artist a few years ago. It was Africa that re-kindled my desire to paint the natural world and still inspires me today even after more than 20 years. 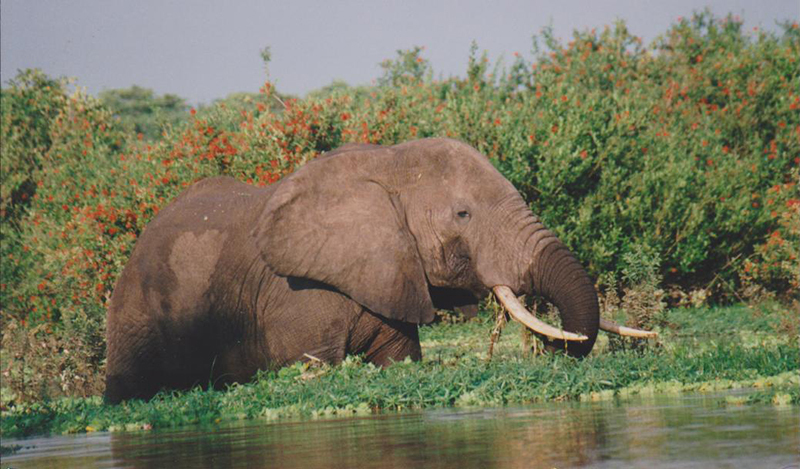 A continent that is full of great diversity and contrast both from people, wildlife and habitats. It contains many of the world's greatest natural wonders boasting the highest free-standing volcano, the longest single curtain of water and is home to the worlds longest river. Africa is home to the largest and driest desert covering one fifth of the continent together with the most ancient at over 80 million years. The Great Rift Valley which stretches for 3,700 miles, can be seen from space- it is a truly awesome and unforgettable continent which has inspired many artists and adventurers for centuries. When Shakespeare wrote " I speak of Africa and golden joys" his thoughts have been shared by many over the centuries. I hope the following extracts from my diaries will excite and inspire you to follow in their footsteps as I have. 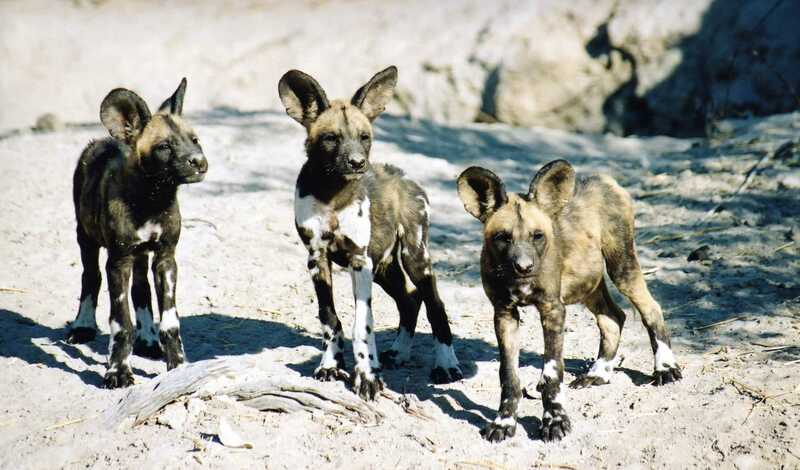 WILD DOGS OF THE OKAVANGO - Published in the Wildscape magazine. 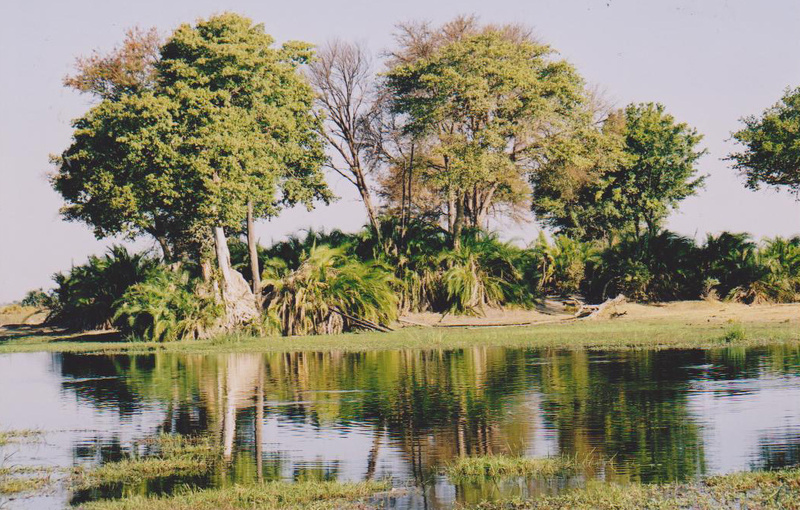 The Okavango Delta in Botswana, Africa's last true wilderness, an enchanted oasis, one of the world's greatest wetlands, a Garden of Eden - it is all of these and more. 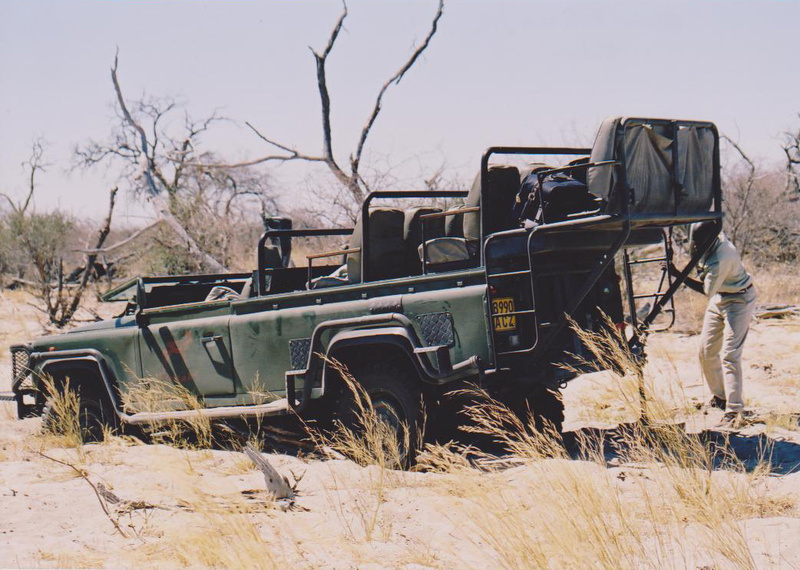 Surrounded by the Kalahari Desert, the fact that it exists at all is a miracle of nature. This is home to the African wild dog, one of the few remaining refuges left to this most endangered of the continents larger carnivores. Through a dreamy haze I became aware of the distant evocative sound of a horn and tribal drums - it was 6am and camp wake up call, We were off to see the wild dogs again..............those first few moments of excited greeting as the adults returned and the pups continued to beg for food..............at this stage of their development, life is a game of discovery and full if innocent curiosity, the serious business of survival would come soon enough but for now they could enjoy the unbridled pleasure of puppyhood. We were about to have only our second close encounter with leopards in all our years of safari travels but this was to be something extra special. The first time we found leopards had been some years before in Samburu, Kenya when we had thought ourselves very lucky at the time...............what we were about to see was probably a 'once in a lifetime experience' that we would never witness again, for we had found a mating pair of leopards. Secretive and difficult to find at the best of times, here we had a male and female, out in the open not hidden from view and apparently oblivious to our presence. If they knew we were there, and I'm sure they did, they were completely unconcerned..............we watched them for over an hour before leaving them to their 'love-making'...........even our driver was surprised and remarked on how privileged we had been. 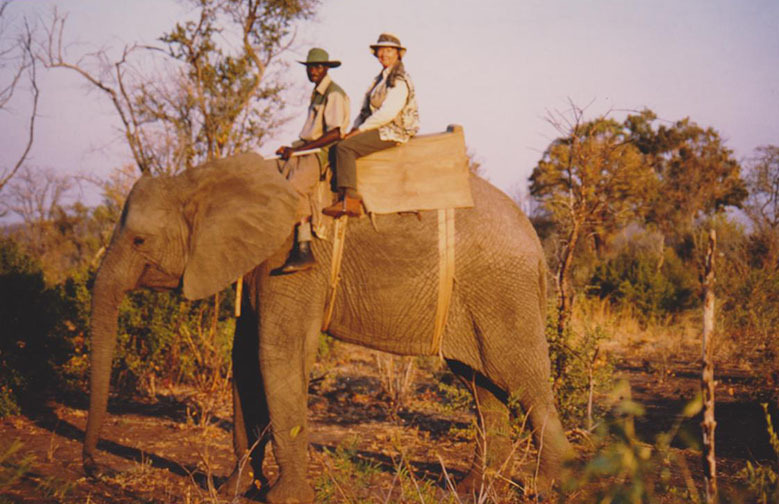 Botswana had indeed been very special not just from our wildlife encounters but the scenery was different from anything else we had seen in Africa, especially the magic of the Okavango Delta. Unlike Kenya or parts of Tanzania, you could travel all day and not see another soul, you were alone with nature in all it's beauty and drama. Our brief trip into Zimbabwe was to see Victoria Falls as we were relatively close at the end of our safari to the Okavango. The Falls are a once in a lifetime, must see experience, which will leave you breathless at the sheer awe inspiring spectacle. One feels insignificant against such a power of nature, no wonder it is called 'The Smoke that Thunders' when the mist cloud created can be seen up to 50 miles away and the roar is heard even 12 miles away. Our visit took place in August but when the Falls are in full flood ( December- March) the sight must be almost unbelievable with water cascading over the edge at a rate of 2 million gallons per second, plummeting 330 feet to the gorge below. 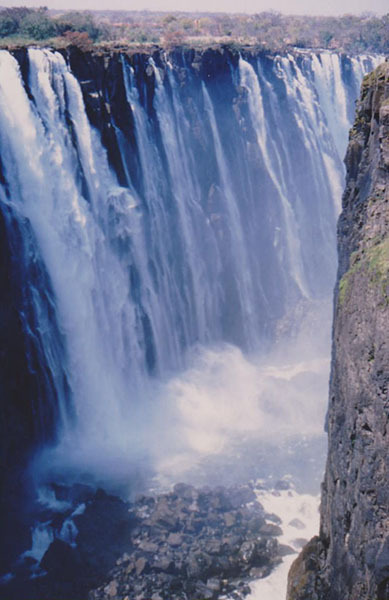 It is the largest curtain of falling water in the world, being 1.25 miles wide, and the experience will live with me until I breathe my last. Before returning to the U.K. we were to enjoy a game drive on elephant back at our overnight camp. The elephants had all been rescued or orphaned and now formed a new family who seemed quite amenable to having humans riding on their backs. Our African mahouts sat behind their ears just like the Indian version and we climbed a special platform to sit on the saddle...........viewing the bush from such a high vantage point, swaying gently from side to side was quite relaxing and the wildlife took no notice at all............going uphill or down was tricky, in order to avoid falling off you needed to lean the opposite way.......I wish it was possible to do all game viewing on elephant back, it is quieter, more natural and so peaceful. 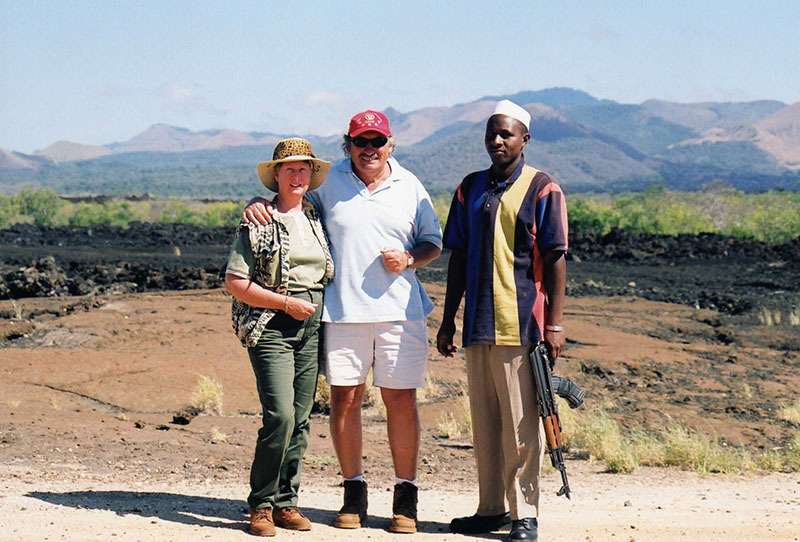 My safari travels in Africa have given me many memorable experiences and I never tire of visiting that vast and diverse continent year after year. Each time I say 'Kwaheri' I know I shall return, the distant drums will call me back with the beat and rhythm that is the life of Africa.